NORTH EAST Stars are off the bottom of the Pro League standings for the first time this season, albeit only by goal-difference, and the holders must thank goalkeeper Glenroy Samuel for a 0-0 draw against Morvant Caledonia United in a rescheduled clash on Tuesday night at Ato Boldon Stadium in Couva. 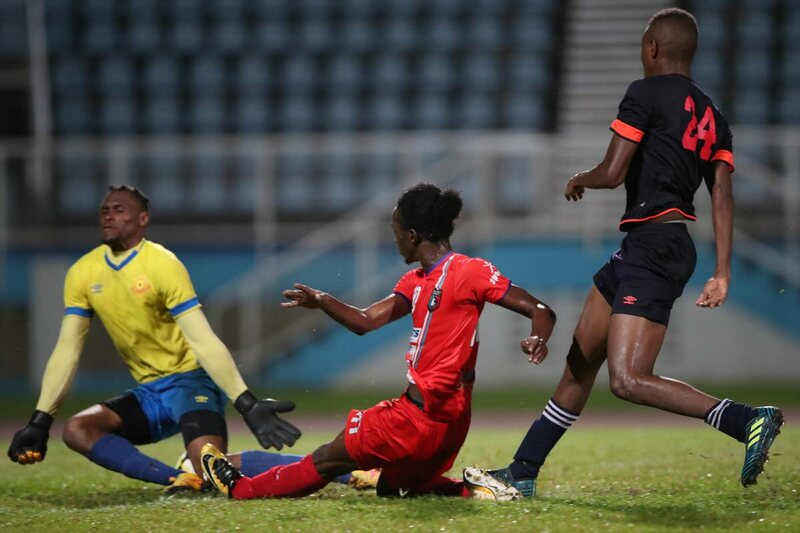 The 28-year-old Trinidad and Tobago former Youth World Cup ‘keeper made a second half penalty save to deny Morvant Caledonia star Keron Cummings and three other crucial stops in the half to blank his former employers. North East Stars, with the point earned, hurdled Terminix St Ann’s Rangers for ninth place on the ten-team ladder but are only ahead by a superior goal-difference with both teams on six points, while Morvant Caledonia (15 points) remain three points behind sixth-positioned Sando with six league games left. “We are much more competitive now,” said North East Stars’ coach Zoran Vranes, whose side are, for the first time this season, unbeaten in two consecutive outings with their previous outing a narrow 2-1 win over San Juan Jabloteh. North East Stars had a chance to grab the lead after 30 minutes from the penalty spot after Josiah Daniel was brought down by Malik Mieres in the area, but ex-Morvant Caledonia forward Kordell Samuel failed to beat Terrence Lewis – the ‘keeper sprawling to his left to match the striker’s effort. Three minutes into the second half referee Keilon Bacchus pointed to the spot again when Grenada international forward Saydrel Lewis went to ground in the North East Stars’ box after a challenge from recently signed central defender Dwane James, but Samuel matched his opposite number to deny Cummings, who lacked conviction from as early as his casual approach to the kick. Samuel followed up with two more saves, the second to deny substitute Sheldon Holder six minutes from time before defender James cleared at the goalmouth to keep out a follow up effort from Saydrel Lewis as Morvant Caledonia struggled against a side they washed comfortably 8-0 on September 28. A stoppage-time miss by substitute Quincy Ballah with Samuel at his mercy dropped the curtain on a miserable performance by the “Eastern Stallions” who must next host Rangers in the first game of a double-header from 6 pm tomorrow at the Ato Boldon Stadium. Jabloteh will tackle third-placed Police FC from 8 pm in the second game. North East Stars will host Defence Force FC from 3.30 pm at the Larry Gomes Stadium, Arima on Saturday. Also on Saturday, W Connection and Central FC will square off in a top-of-the-table clash from 3.30 pm at the Manny Ramjohn Stadium. Pro League action will return to the Marabella venue on Sunday with Club Sando hosting Point Fortin Civic from 3.30pm. Reply to "Brilliant Samuel saves Stars from defeat"